Our Copenhagen cruise port guide gives you information about the docking location, cruise dock, transportation options and much more! Welcome to the Copenhagen cruise port guide. Copenhagen is the capital of Denmark. It is also Scandinavia’s largest and liveliest city with a population of 550.000. It has repeatedly been recognised as a city with perhaps the best quality of life and this would be no surprise. If you look at Copenhagen from a visitors point of view you can see that this city is very well though out. The Danes have a system that works and they know how to enjoy it. It is balanced. The city also enjoys the status of being one of the world’s most environmental friendly cities. Even the water in the inner harbour is so clean that is is safe to swim in. 36% of all citizens go to work by bicycle and everyday they cycle a combined 1.2 million km. It is a city that has lots to offer. Enjoy the nice atmosphere while visiting one of the 100 museums or admire the old historical buildings combined with the new Danish design. It is a place where art, design and history blend in just perfectly creating the best balance. No wonder the people of Copenhagen are among the happiest in Europe. 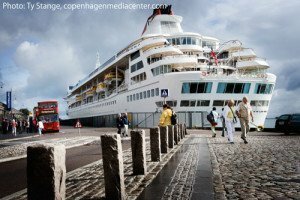 Find out underneath what it is you want to do in this Cruise Port Guide Copenhagen – Denmark. This is the Langelinie pier. This is a common spot for the ships to dock, but there are also several other options. The langelinie pier has facilities like a mobile tourist information point at the pier, souvenir shops, hop on hop off bus and public transportation around the corner. Cruise ships can dock at Langelinie (normal dock), Freeport (turn around port) or Nordre Todlbod Quay (small ships). Copenhagen has a lot of docking possibilities for cruise ships. The new cruise terminal Ocean Quay is expected to be in use soon and it will facilitate most ships in the future. For now most cruise ships dock at the Langelinie, but check with your ship what their plan is. If you want you can already check this information your self at home via the following link: http://www1.cmport.com/ships-in-port/calls/copenhagen. Search for your ship and date. This should tell you where your ship is planned to dock. Please know Ocean Quay is quay numbers 330, 331, 332, 333 and 334. Freeport is quay number 252, 254 (266). Langelinie is quay number 190, 192 and 197. Ndr. Toldbod is quay number 177. Now that you know this you can start planning your day. Find more detailed information about the ports underneath. Copenhagen’s public transport is very extensive. You can use the S-Trains, Metra and busses to get around. The hop on hop off bus is available on the pier in Copenhagen. Choose wisely before buying your ticket. They have different companies, different routes and you can opt for a canal tour as well. When purchasing your ticket you can pay in DKK, EUR and with credit card. Buy a Copenhagen card and get entry for 75 attractions and free transport. Choose between 24/48/72/120 hours optons. This card cannot be bought in port. Buy this card at S-Train stations, Airport, Central Station of Tourist Office, opposite of Tivoli. There is a luggage storage at the central station of Copenhagen where you can leave your luggage for a small fee. The Rosenberg castle holds 400 years of royal art treasures and the Crown Jewels and Royal Regalia. It truly is a splendid museum. This is one of the most famous attractions of Copenhagen. It is the 2nd oldest amusement park in the world. When it opened in 1843 it was an instant succes. Today you will find 26 rides, gardens of different types, a china town, aquariums and the inspiration for the Disney palace here. Take bus 26 from the cruise docking spot (depending on where you dock) to Tivoli gardens. The Glyptotek is the most famous museum of Copenhagen. Any lover of art should visit this museum. Ny Carlsberg Glyptotek was founded in 1888 by the brewer Carl Jacobsen. It offers a unique combination of ancient and modern art in an impressive architectural surrounding. Glyptotek is in the centre of Copenhagen. In the city centre of Copenhagen we find Christiansborg Castle. See map above for its exact location. This is the seat of the Danish Parliament, the Prime Minister’s office and Supreme Court. Slotsholmen is an island in the middle of the city centre. It is very interesting part of town you should not miss on a visit to Copenhagen. Here you wil find museums like: Royal Library, National Archives, Royal Arsenal Museum, Royal Stables, Theater Museum, Thorvaldsens museum, Danish Jewish Museum and The Lapidarium of Kings. Visit the famous freetown of Copenhagen. In 1971 a small group of people took over the military backs and attempt to create they utopia. 2 generations later those idealist are still here defending their believes and to live their lives on their terms. For this location goes: You love it or you hate. One thing is for sure: if you are looking for hippy style this is the place to go to. You’ll find Christiania at the east part of the city. Best way to get there is by metro. Step off at Christianshavn station. This is one of the tallest buildings in Copenhagen. There are about 300 steps from the ground level to the top where you can enjoy one of the best panoramic views of Copenhagen. 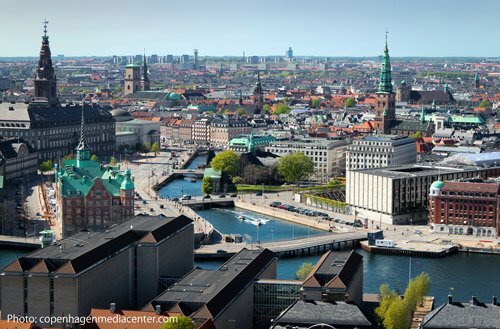 If you want you can also take a guided tour in city hall and learn about Copenhagen’s history. You’ll find city hall in the city centre. See map above for its exact location. You can take public bus 26 from the cruise terminal. What the Eiffel tower is for Paris is what the Little Mermaid is for Copenhagen. She comes straight out of the story of Hans Christian Andersen. The statue was a present from Carlsberg Breweries in 1913. This is the manditory photo stop in Copenhagen. Also known as “Hamlet’s Castle” stand 47 km north of Copenhagen. Take a day trip to this historical castle. Please know your ship will also sail past it. Most (bigger) ships have to approach Copenhagen in and out of northernly direction, because they cannot pass under the Oresund bridge south of Copenhagen. If that is the case this means your ship will be passing by Kronberg castle twice about 2 hours after departure in Copenhagen. If you want to visit for the day take the train. This is the Langelinie cruise dock in Copenhagen. 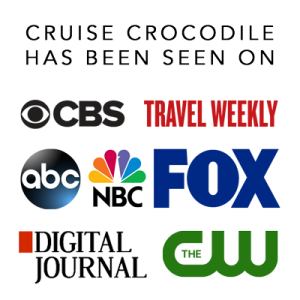 Cruise ships can dock at several locations in town. 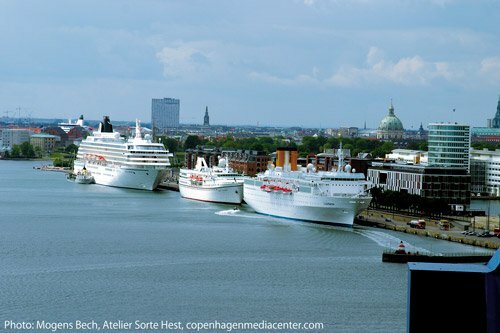 Read all about where your ship can dock in the full Copenhagen cruise port guide here. In the centre of Copenhagen you will find the 10 hectare large botanical gardens. The garden has 27 glasshouses of which the eyecatcher is the glasshouse from 1874. You’ll find over 13.000 species in the garden in different sections. This massive church is also known as the Marble Church. Its construction lasted for 150 years, but the result is one of the most beautiful churches in the country. Its copper green dome is the 4th largest in the world. When talking about Copenhagen you will have to mention the name Hans Christian Andersen. He is the famous Danish writer of books that are known around the world. Just to name a few: The Ugly Duckling, The Princess and the Pea and Little Mermaid. He is as the father of fairy tales. Step into his footsteps in Copenhagen where he lived most of his life. Hans Christian Andersen has lived in 3 different houses on Nyhavn. No. 20. is where he wrote the fairy-tales ‘the Tinder-Box’, ‘Little Claus and Big Claus’, and ‘the Princess and the Pea’. He moved in in 1834. Denmark is the oldest Monarchy in the world and this is the official residence of the royal family. Amalienborg is considered one of the greatest works of Danish Rococco architecutre. It was constructed in 1700’s. It has 4 identical palaces around one beautiful courtyard. Every day at noon, you can watch the change of guards in the court yard at Amalienborg. The route starts at 11:30 at the barracks of Rosenborg castle and it goes by: Rosenborggade, Købmagergade, Østergade, Kongens Nytorv, Bredgade, Sct. Annæ Plads, Amaliegade and Amalienborg. During the summer, Nyhavn is the perfect place to enjoy a nice cold beer. Nyhavn means New Haven, although it is the old harbour of Copenhagen. There are lots of things to do here. Hop on a canal tour here, go for that beer, check out the street artists or find out the history behind all the buildings. This is the largest cultural and historical museum of Denmark and therefore it is seen as one of the most important. The museum takes you through times gone by with exhibitions about vikings, Egyptian mummies and Christiania. This the main street of Copenhagen and Europe’s first mayor pedestrian boulevard. It is a network of lively streets that streches all the way through the old town. If you are planning to go shopping in Copenhagen, make sure to start here!